The first Labour government was formed in January 1924, following the general election of 6 December 1923. James Ramsay Macdonald served as both Prime Minister and Foreign Secretary. 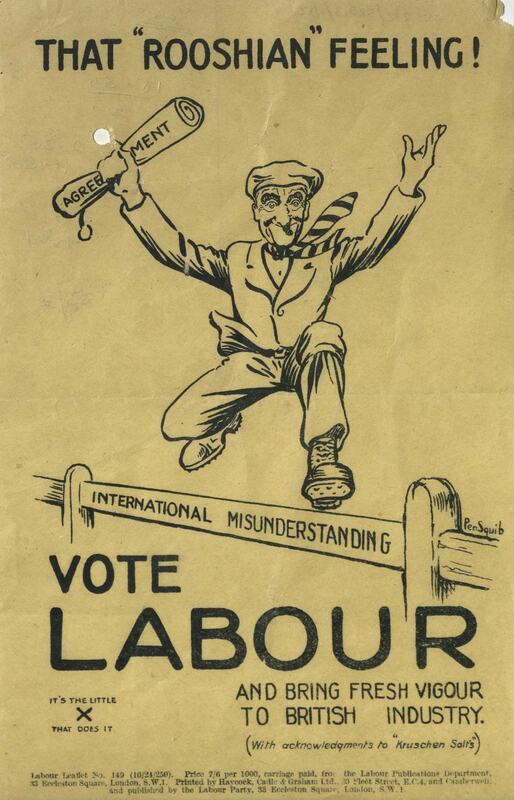 One of the Labour government's key foreign policy initiatives was to attempt to normalise relations with Soviet Russia through two Anglo-Russian treaties. The treaties were intended to settle outstanding points of dispute between the two countries and lay the grounds for a resumption of trade. Accusations that the Labour Party was a 'Red' organisation, controlled by the Communist Party, contributed to the downfall of the minority government. In August 1924, the government dropped the prosecution of the Communist newspaper editor J.R. Campbell under the Incitement to Mutiny Act (for calling on members of the armed forces to refuse certain orders); Conservative and Liberal Members of Parliament then combined to pass a motion of no confidence in the Labour government and a new general election was called for 29 October 1924. Shortly before the day of the election, the Daily Mail published a letter alleged to be from Grigory Zinoviev, head of the Communist International, which it argued revealed "a great Bolshevik plot to paralyse the British Army and Navy and to plunge the country into civil war", and the Communist Party as "masters of Mr. Ramsay MacDonald's Government". The letter was later confirmed as a forgery. The Labour Party lost the 1924 general election, the Conservatives returned to government and the draft treaties with Russia were taken no further. The documents in this section look at the 1924 general election (including publicity material which promoted the Anglo-Russian treaties), investigations into the authenticity of the 'Zinoviev Letter', and the fear of 'Reds' in the labour movement. General Election October, 1924 : Appeal to the Officials and Members of British Trade Unions. Appeal from the Trades Union Congress General Council for unionists to defeat the "conspiracy of our political opponents" and return a Labour government. It includes a section emphasising the proposed treaties with Russia. Labour's appeal to the people, 1924. General appeal by the Labour Party, including reference to the "essential" Russian treaties. West Toxteth election special, 1924. Broadsheet issued in support of Joe Gibbons (who had been elected MP in a May 1924 by-election). Gibbons retained his seat. Vote for Ben Tillett, the Labour Candidate, 1924. Tillett, MP for North Salford since 1917, was defeated by the Conservative candidate. After the election he visited Russia as part of the 1924 Trades Union Congress delegation. Liberal Party election leaflet for Aberavon Parliamentary Constituency, 1924. It attacks the Russian Treaties as "preposterous". Labour's great record: an outline of the first six months' work of the Labour government, 1924. Illustrated pamphlet produced by the Labour Party to promote the work of the minority government. It includes a section on the Russian treaties and Ramsay Macdonald's work as Foreign Secretary (as well as Prime Minister). The Anglo-Soviet treaties, September 1924. Pamphlet which attempted to remove "misapprehensions" about the treaties. The Anglo-Russian treaties, 9 September 1924. Circular sent to trades councils and local Labour Parties. The truth about the Russian treaties. Leaflet produced by John Wilmot, Prospective Parliamentary Candidate for East Lewisham. Wilmot was defeated by the Unionist candidate. Truth about the Russian Treaties, October 1924. Summary of the treaties, with attack on "humbug" of political opponents. The Truth and The Treaty, October 1924. The leaflet counters accusations that the treaties are "some terrible agreement engineered by a terrible Government behind the Nation's back". Liberal Dealings with Russia, October 1924. Leaflet which points out that the "Labour Government is not the first Government to make Treaties with Russia". Liberal Treaties with Russia, [October 1924?]. Leaflet produced for A.A. Purcell, a strong supporter of Soviet Russia who had been elected as MP for Coventry in 1923. He was defeated in 1924 by the Unionist candidate. Tories support the Russian Treaty, October 1924. Leaflet which promotes Ramsay Macdonald as "The Peacemaker", and condemns Conservative opposition to the treaties as "due to party tactics". That "Rooshian" Feeling, [October 1924]. This leaflet spoofs an advert for the patent medicine Kruschen Salts to promote the Russian treaties as bringing "fresh vigour to British industry". Big Orders for Britain, [October 1924]. Leaflet which argues that the treaties will mean "more work for British workers", including statistical information about the orders that Russian companies intended to place with British firms. Civil War Plot by Socialists' Masters, 25 October 1924. This is the Daily Mail article which first introduced the 'Zinoviev Letter' to the general public. It describes the alleged letter from Zinoviev ("whose real name is Apfelbaum") as revealing a "a great Bolshevik plot to paralyse the British Army and Navy and to plunge the country into civil war", and the Communist Party as "masters of Mr. Ramsay MacDonald's Government". "Gross falsification". Telegram sent by Zinoviev and received by the Trades Union Congress on 26 October 1924. In the telegram Zinoviev denies authorship of the 'Zinoviev Letter' and condemns it as a crude forgery produced as an "election manoeuvre". 'The Zinovieff Letter: Narrative of facts', November 1924. Internal Labour Party and Trades Union Congress report into the initial Foreign Office response to the letter. Correspondence between representatives of trade unions and the Labour Party about the labour movement's investigation into the 'Zinoviev Letter', 22 November 1924 - 3 February 1925. Telegram from the Trades Union Congress delegation in Moscow, 26 November 1924. They state that they are "absolutely satisfied that the document is a forgery" and comment on the "bad impression" that the letter and subsequent government response has made in Russia. A later telegram, sent on 10 December 1924, is also available. Draft report on the "Red Letter", [1924?]. Initial internal report produced by members of the Trades Union Congress delegation to Russia. It includes a recommendation to publish the report into the 'Zinoviev Letter' separately from the main delegation report, to prevent press coverage of the "sensational" findings overshadowing the inquiry into conditions in Soviet Russia. Letters between the Trades Union Congress and the Prime Minister's Office regarding the Labour Party's request for officials in the Foreign Office and Home Office to help with an investigation into the authenticity of the letter, May 1925. The request was refused as being "wholly without precedent". The "Zinoviev" Letter, 18 May 1925. Report of the investigation by the Trades Union Congress delegation to Russia. It includes a description of the investigation in Moscow and copies of relevant documents. 'Zinovieff Letter "A Forgery"', 18 May 1925. Manchester Guardian coverage of the Trades Union Congress report. Zinovieff Once More, 19 May 1925. The Times' coverage of the Trades Union Congress report. It dismisses the conclusion that the 'Zinoviev Letter' was a forgery. History of the Zinoviev Letter: Facts about the infamous letter, 1925. The Communist Party of Great Britain's "documentary history of the "Red Letter"", written 10 months after the 'Zinoviev Letter' was made public. It includes a critical analysis of the contents of the letter. Anti-Soviet forgeries, 1927. Pamphlet published by Workers' Publications Limited. A chapter of this "record of some of the forged documents used at various times against the Soviet government" is dedicated to the Zinoviev Letter. The "Red" Plot, 1924. Notes for speakers issued by the Labour Party. The notes attack the 'Zinoviev Letter' as a "stunt" fabricated by "the Tories and the Rothermere press", and deny accusations that Labour is "under the heel of Moscow". Facts about Fascism and Communism, 1924. Pamphlet published by the British Fascisti whilst the Labour government was in power. It quotes from Communist documents to imply that the Labour Party and trade unions were in the process of being captured by followers of the Communist International. To parents: Save the children of the nation, [1924?]. This British Empire Union leaflet attacks socialist Sunday schools and the teaching of "blasphemy, immorality, revolution". To Women. Socialism Destroys Marriage and Real Socialism: Authenticated Extracts from Socialist Leaders' Speeches and Writings, February 1925. Leaflets produced by the Unionist candidate for the 1925 Walsall by-election, which portray the Labour Party as filled with revolutionaries dedicated to the overthrow of the monarchy, religion and family life. The Red Conspiracy leaflets, 1925. Series of leaflets which attack various aspects of trade unions and Communism, including the National Minority Movement. Although the name of the issuing organisation isn't printed on the leaflets, they appear to have been published by Coal Industry Publications in the run-up to the British General Strike. Other Coal Industry leaflets are included in our digital collection on the General Strike. Communist Papers. Documents selected from those obtained on the arrest of the Communist leaders on the 14th and 21st October, 1925. Government publication, issued in June 1926, which reproduces papers seized from the head offices of the Communist Party of Great Britain, National Minority Movement and other key Communist organisations in 1925. It includes sources on the relationship of the British party with the Communist International. The progress of the Communist Party of Great Britain, 1925. Translation of a speech by Zinoviev, made on behalf of the Central Committee of the Communist Party to the 14th All-Russia Communist Party Congress. It was originally published in the Soviet newspaper Izvestia in December 1925.
International Anti-Bolshevik Review, March 1926. Special issue of the journal of the Office of the International Entente against the Third International. The virulently anti-Communist publication focuses on the "Bolshevik International" and "Bolshevism at work throughout the World". including a report on the situation in Britain by Dr Arthur Shadwell (Glasgow is identified as being particularly dangerous). An open letter to John Bull - trade unionist, undated [post 1926]. Leaflet issued by the British Empire Union, aimed at working class members of trade unions. Hands off Britain!, 1927. Leaflet for the Clear Out the Reds Campaign, which asks "every decent citizen" "how much longer will you stand by tamely and leave England gagged and bound, while Bolshevik outcasts spit in her face and stab her in the back?". The campaign was headed by the anti-Communist (and later equally fervent anti-fascist) Conservative MP Oliver Locker-Lampson. Lest we forget: the British Empire Union advises you to remember..., [1929?]. Leaflet issued by the British Empire Union. It reproduces Ramsay Macdonald's 1917 expression of support for the Menshevik revolution and presents it as the "real reason why the present socialist government were so anxious to renew diplomatic and trade relations with the Bolsheviks".